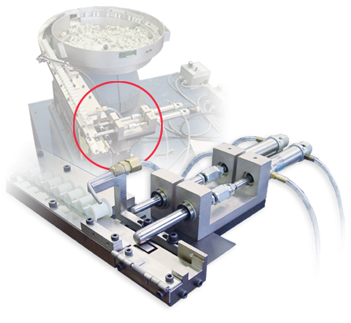 Automation Devices, Inc. (ADI) offers complete parts feeding application solutions that include part escapements and nests. These are most often the points at which a robotic arm, a pick and place system or other automated assembly equipment receive the parts necessary for the next production process. The following vibratory feeder applications illustrate ADI's capabilities in designing and engineering the sometimes most complicated aspect of a parts feeding system. This is an example of a static parts nest where parts are delivered to a pickup point where a robotic arm picks the part up. Another part immediately fills the vacancy once a part is removed. 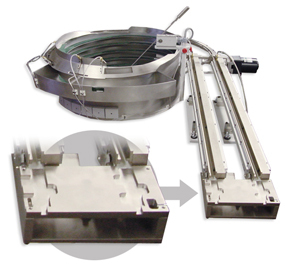 The linear feeding track and nest are Nickel Plated for added durability and rust prevention. 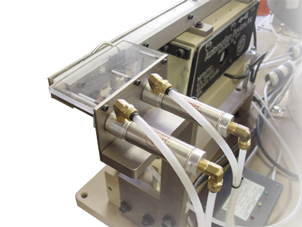 This system shows an inline feeder with a linear track leading to a hold-and-release part escapement. The air pistons are typically controlled by a PLC which releases the parts in synchronization of an assembly machine cycle. This is another example of a hold and release escapement utilizing pneumatic pistons to control the release of the product. An 8827 Fiberoptic Sensor is used to detect the presence or absence of a part within the track. Back pressure controls ensure an ample supply of parts and greatly reduce bowl wear. Learn about the various components of a typical vibratory parts feeding system. Automation Devices manufactures vibratory parts feeders and the full range of vibratory feeding equipment down to the individual components.